Cozy up in your favorite cashmere pieces! Cashmere is the softest, lightest wool fabric, and it’s perfect for this time of the year! But before wrapping yourself up in this luxurious material, find out how to wash and care for it. Would you believe us if we said that you can safely wash your cashmere without dry cleaning? We didn’t at first either, but it’s true! Properly hand washing your cashmere garments can keep them looking (and feeling) their absolute best without the hefty dry cleaning bills. Fill a sink or basin with warm water; never use hot water—it can cause your cashmere to shrink! Toss in a premeasured detergent pac (Dropps Minis are the perfect amount of detergent for hand washing one or two items) and swish it around in the water until it dissolves completely. Dropps detergents are easy to use and extra gentle on natural fibers like cashmere. Turn your garment inside out and submerge it into the water, lightly pressing the fabric until it is completely soaked. Swish the garment around and gently work the detergent through the fabric. Drain the water, and then refill the basin with clear, tepid water and rinse until there are no suds left. Gently press (don’t wring!) the excess water out of your garment and then lay it flat on a clean, dry towel. Roll the towel up with your garment inside, lightly squeezing along the way to absorb as much water as possible. Lay flat or on a garment rack to dry completely. Be sure not to hang or use clothespins while it is still wet; delicate fabric like cashmere can stretch out when wet. In order to prevent your best cashmere from pilling, avoid pairing it with any rough textures like bulky necklaces or textured handbags. In addition, don’t be tempted to wear your cashmere too frequently in between washes—we recommend washing every two wears. 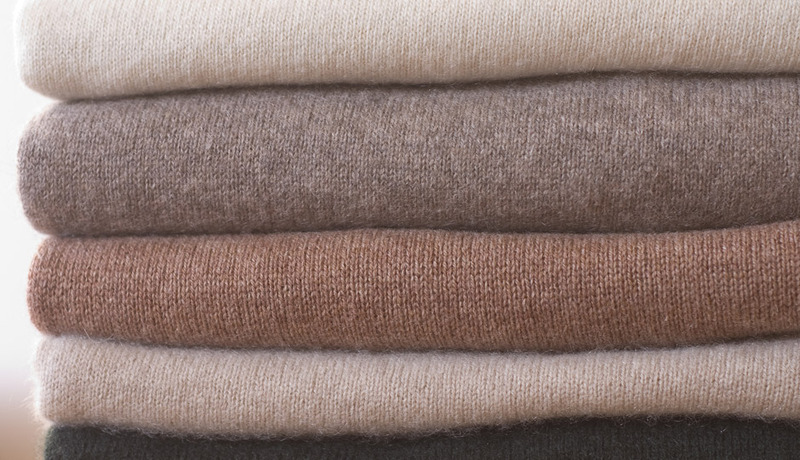 When storing your cashmere garments, always make sure they are completely clean and dry first. Any moisture or dirt can attract moths and yucky smells. Store your sweaters by folding them carefully (hanging for long periods of time can cause stretching in the shoulders) and keeping them in a cool, dry space. For more fabric care tips + tricks, see our handy Fabric Care Guide.